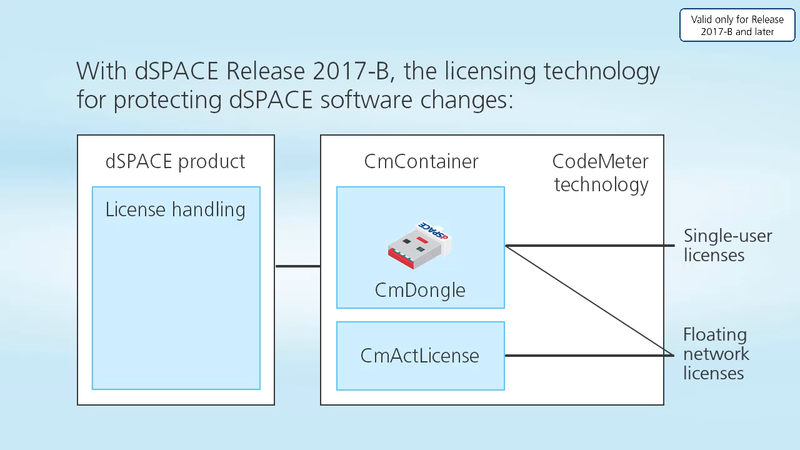 As of dSPACE Release 2017-B, the licensing technology for protecting dSPACE software changes. From this Release forward, the WibuKey (for dongle licenses) and FlexNet technologies (for floating network licenses) are replaced by the CodeMeter licensing technology. This video introduces you to the new technology. New Licensing: Migrating from Old CmDongles This video guides you through the migration process for CmDongles delivered before dSPACE Release 2017-B. New Licensing: Migrating from WibuKey Dongles This video guides you through the migration process for WibuKey Dongles (valid only for dSPACE Release 2017-B and later). New Licensing: Activating Licenses and Decrypting Software Archives This video guides you through the license activation process for single-user licenses as well as the decryption process (valid only for dSPACE Release 2017-B and later). New Licensing: Updating Licenses This video guides you through the license update process with local access to a CmContainer (valid only for dSPACE Release 2017-B and later).